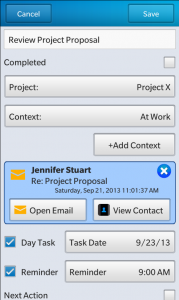 Viira 5.2 for BlackBerry 10: Email Tasks, Backup/Restore And More! 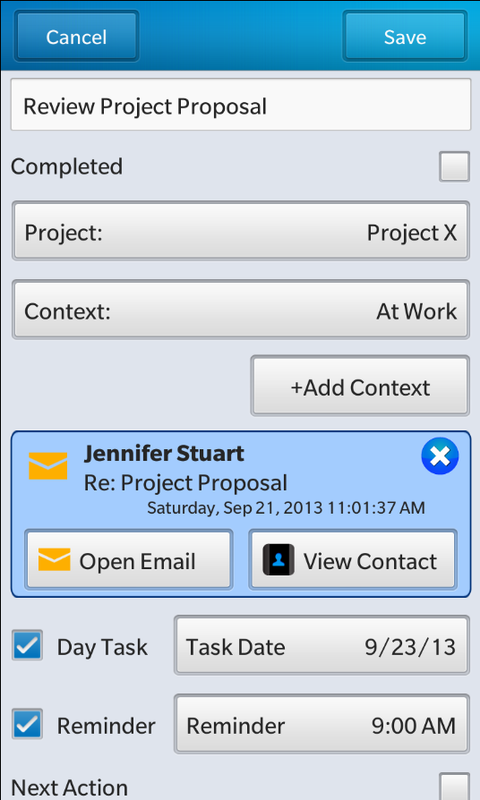 We just released version 5.2 of Viira for BlackBerry 10 which contains a feature that many of you have requested a lot over the past few months: the ability to associate a task with an email. 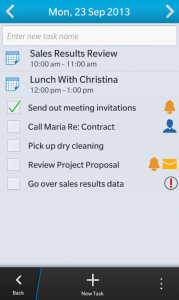 Many of you who used Viira for BlackBerry OS found this feature indispensable for staying organized and being on top of your email and we are glad to be able to bring it in Viira! 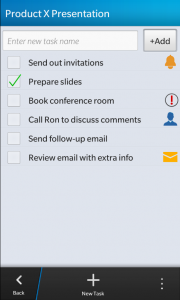 Email Tasks. Organize your email by adding an email to any task in Viira. 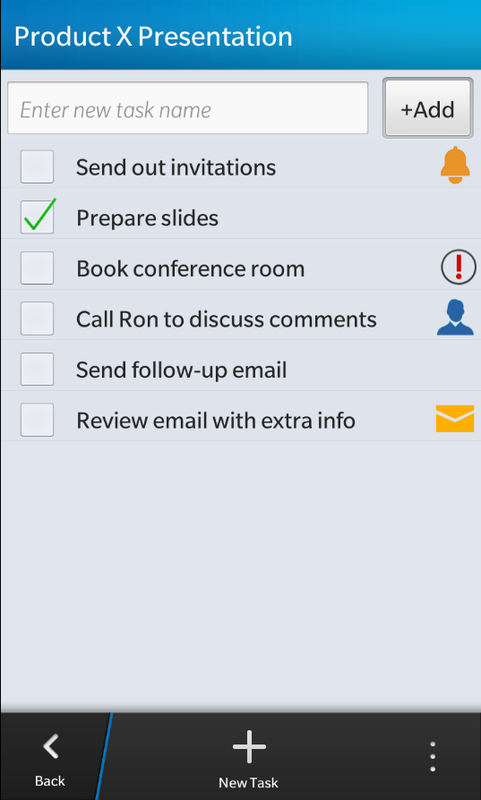 You can then organize your email task and file it in a project, context, day, flag it as a next action or even add a reminder to it. Similarly to adding a contact to a task (available since version 5.1), to add an email to a task open the task, click on Add Attchment, then Email and select the email in the list. You can preview the email you are about to add via a long tap. The fast search field is there to help you quickly find the email you were looking for. Backup/Restore. You can now backup your Viira data to a file on your SD Card for an extra peace of mind. To achieve an extra level of cloud-based backup you can backup your data to your Dropbox folder and Dropbox will automatically save your Viira backup file to the cloud and replicate it to your other computers and devices on which you have set up Dropbox. Inbasket Reordering. The “Reorder Tasks” panel is now available in the Viira In-Basket as well, enabling you to prioritize your incoming and unassigned tasks. This release also contains a number of other small additions, tweaks and fixes so make sure to check it out! You can download the latest version of the Viira free trial from BlackBerry World. For those of you who already have the full version you can update to the latest version from here. This update is great; especially with the backup/restore function. Is there a way to filter tasks by two contexts? For example, filtering by “@computer” AND “Now” to see everything that must be done at a computer AND now, as opposed to everything that must be done in front of a computer, regardless of when it must be done. If not, is this feature in the works? With this feature, it would be the best GTD program out there, hands down. I can’t choose which account I attach my emails from? It defaults to my personal email account although there are no restrictions on my work account? What am I missing? Jake, we are glad to hear that you like what we have done in this update! Good suggestion for the ability to filter on multiple contexts, I can see how it can be useful. Right now Viira only can filter by a single context but we are designing a few ways to provide more powerful filtering in an enhanced search/filter view. We are trying to include this feature in the next software update so stay tuned! John, as of version 5.2.1 Viira displays all your emails from all email accounts just like you would see them in your BlackBerry Hub: all emails in one list and grouped by day.You should see email from all your accounts. Let us know if this helps and do send an email to our support line if you need any further assistance with this. Hi, yes I am on BES server however there is currently no restriction or separation of the personal and work sides. I can only see personal. Previous to this update I could choose between accounts however the work email option was greyed out so I could not select it. Now that it is like the hub it just shows personal emails. If BlackBerry Balance is unlocked does my IT dept still need to authorize or load the app on the work partition? John, if your work email was appearing as greyed out we are probably looking at some access/permission configuration related to your work email. It is possible that your IT department has protected or disallowed integration against your work email account. I have forwarded this to our support staff who will be contacting you shortly about how to (a) find out more about your BB/BES 10 configuration and (b) provide a fix for this.